For two centuries (this started right after the definition by genius mathematician Albert Einstein before world war one) the search for a near-lightyear speed, and beyond that limit was the ultimate incentive for reaching the nearby stars. This was not easy, as by the end of the XXth Century and still by 2020 no effort was made to reach Mars quickly, billions of times nearer already. Nevertheless, NASA and other spaces agencies still concentrated on chemical boosters and small ion engines for satellites at tat time. They still did not have a clue of how to pass a tenth of lightyear speed already although there were many solutions already feasible like solar sails, nuclear propulsion, fusion propulsion (by the 2030s), with of course the ultimate prize, antimatter force harnessing. Needless to say, waiting for the cycle to bring Proxima system at 3.11 LY the star every 26,700 years was not desirable. By 04 August 2020, the first spaceship designed to reach Mars for distant operations, ITS-1, exceeded 100 meters. It was relatively compact, and used nuclear reaction combined with plasma to reach 1/15th of the speed of light. Mars One, very much a world's funded project headed by NASA, joining ESA and the Russian Space agency and Japan, still excluded China and India. The first worked feverishly on its own project, in a bid to launch it faster. Mars One reached the red planet in three month as expected, delivering payloads and drones to prepare for human colonization, which came with Mars Two. By 2028 after almost yearly rotations, the first permanent human base on Mars was a reality. But this was merely a bug crawling on the side of an olympic pool. In 2031 another settlement on the moon gave additional experience in prolongated planetary life, but propulsion remained classic, until the first fusion reactor became operational, whereas antimatter theoricians came with new ways of domesticating the monster. For the next step beyond Mars, Jupiter came first. The world community agreed to launch a new ship using a fusion reactor by 2032. The same year in december a previous mission reached Europe and a probe went through the ice and into the ocean, much deeper and colder than first estimated. No life was discovered unfortunately but it was by any standard a great achievement for the complexity involved with AI-driven systems. Fast forwarding, on 28 January 2095, the first truly reliable plasma turbines appears, using Quantum vacuum thrusters using dynamic Casimir effect coupled with a long-way derivated of 2013' Cannae Drive. They propelled a new kind of ship, totally assembled in space with new technologies including balloon-like modules. About 500m long it was to enable reaching Proxima Centauri within 50 years. But this system took its roots in the 1980s Project Longshot, and it was a one-way ticket unmanned probe, with a small payload of auto-replicating fourth gen AI systems. The inital project used an old fusion reaction tokamak-type system creating concentrated plasma and for a total 396 metric tons (873,000 lb) it included a whooping 264 tonnes of Helium-3/Deuterium pellet fuel/propellant. The voyage was to last for 100 years at about 4.5% the speed of light, but the 2090s design reached 15% LS, reducing the trip to just 50 years, acceleration and deceleration cycles included. Still that was of course one-way, informations been sent at LY speed reaching earth 4.39 years after D-day. Since 50 years were still too much, colonization of the solar system (including Mars terraforming) went on. It was only by 17 April 2110 that spaceship Gagarin took off for Proxima Centauri, using hyperbar plasma turbines and antimatter, still a derivated of the Casimir effect drive. This was a 35 years trip this time, the crew and future colonists being suspended for the trip. This was NOT a one-way ticket, most colonists being poised to return back home in their lifetime. Our nearest neighbour was a complex one. With no less than four stars in theory, α Centauri A, α Centauri B, and Proxima Centauri. This was of course the latter, a small red dwarf that made news by 2016 when it was revealed its first planet, a rocky 1.6x earth-size planet orbiting near it, and exciting as it was, at the external fringe of the goldylock zone (or habitable one). The planet then was near enough to be discovered with existing primitive interferometric systems. Of course as years passed, with new telescopes far more precise and powerful, a whole system was discovered and studied long before any mission was sent there. The system counts few planets, as those are cycling a very complex pattern. Outside two rockies (including proxima B), there were also three gas planets, one small, one jupiter like, one neptune-like, at far away, very elliptic orbites. Far enough in fact to not affect a great deal the double G class. Proxima B was already the most interesting, as it was in theory warm enough for water to run freely, and therefore composite acids to develop. This atmosphere was tiny as first measured from afar, and then studied close and personal by the 2145 probe. The irony was the humam mission arrived the same year by virtue of a much more advanced technology, leaving just a few month interval for studies. Gagarin became in 2146 the first interstellar space station -in the sense it was out of the solar system or solsys. First, new probes were sent to explore the system while a communication back to earth was sent too. For some time, the crew would prepare a mission on Proxima B surface, which will became known a century after as "liutgi". The latter had a satellite, much smaller than the moon and 3x as distant, which had practically no effect on it. Liutgi unfortunately did not harbor any life: The thin atmosphere only partly protected from deadly UVs from Proxima A/B. Core activity was long reduced as the planet was fairly old, so the electromagnetic cloud around was relatively weak too, despite an elliptic orbite and tidal forces of the massively more heavy star compared to a similar size planet. 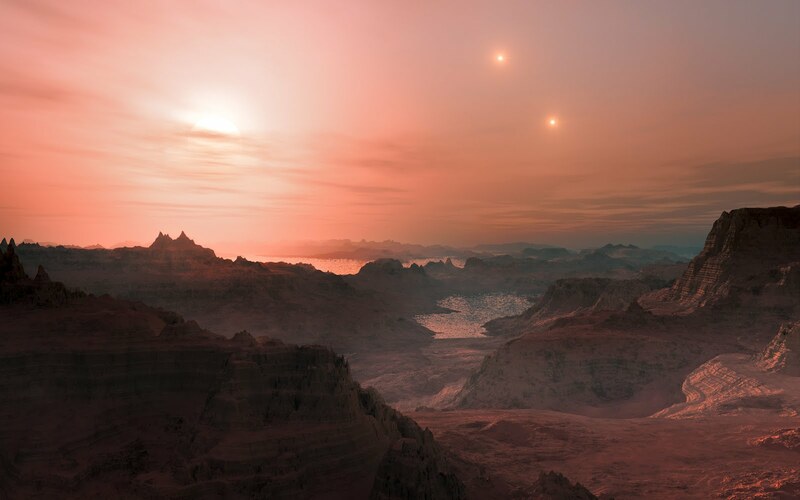 It was discovered later that Proxima b was the aggregate of three older ones. The red dwarf, a M5.5 star was a failed one, barely more massive than jupiter, smaller than many dwarfs, yet warm enough to form a goldylock where Liutgi was positioned. It was however at the very external fringe of it, so cold, average temperature amplitude reaching -80/+15°. Back in 2016 it was estimated its equilibrium temperature was 227k (-46°), same as Venus (on surface). The planet was big enough to drag the star, creating a Doppler wobble, orbiting full cycle every 11.2 days. There was no "day" to speak of as the proximity meant the planet was tidal-locked: Concepts of day and night were locations; One face was perpetually plunged into darkness and much colder. The other was perpetually facing the star, which by the way emitted much more violent and frequent X and gamma-ray bursts. As said the atmosphere was only a residual one, much was gone because of high-energy extreme ultraviolet radiation erosion, estimated (and later confirmed 10,000x greater than earth. In fact pressure was not dense enough for water to settle in a stable form, but there was a permanent convection from the dark side to the bright one, with winds going up to 400 kph in altitude. Fortunately gravity was compatible, just 1.2x greater. However on a geological standpoint, the planet was quite interesting. Like Mars, in its distant past, rivers, lakes and seas traces were found everywhere. 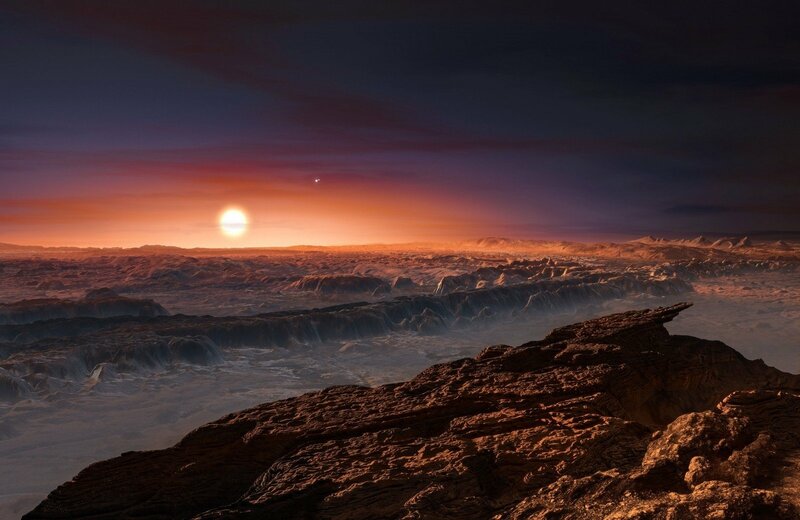 At some point 45 billion years earlier, proxima B was covered at 80% by water, but most of it was concentrated on the bright surface, which was almost desertic. Data collected later shown intensive erosion and probably much greater temperatures and pression for at least 120 million years, long enough for life to emerge, probably on the exchange areas between light and dark, in perpetual "dawn". And surely, unmistakably biological concretions had been found the following years of occupation by drones and humans, to the point of creating a whole catalog of long extinct species. It was a first, something humanity was searching for a long time but earth had to wait for an excruciating four years before the news came out. Life for Proximians, which already by their presence and finding life -if extinct- made history with a big H, went on building the first complexes for a first practical, self-sustainable settlement. At that time, liutgi population was just 35. When they departed by the same means home, they left after 12 sold years n operational base maintained by a fleet of latest generation robots. But more important, they also left auto-replicating machines which started exploring the planet much more thoroughly, while building infrastructures at the same time. The crew would be back in 2180, greeted as heroes. By then, a second mission was already en route since 2142. This time, the ship carried a hefty 280 colonists, which arrived after just 30 years of trip, in 2172. By the beginning of the XXIIIth century, Proxima was Human's first interstellar colony, with the first born and died on location. Some of this first generation of "real" Proximians. Because of gravity, genetically-modified proximians used to be stockier, shorter and more muscular than eartlings, as expected. most discovered earth in their latter years and some stayed here, despite health problems related to a lighter gravity (heart pumping too much blood for example). How life was on Proxima ? Gloomy, to put its straight. The only "user friendly" feature for human was the gravity, which the first colonists found already hard to cope with. Because of the danger of real glass, like in most colonial structures, there were no solid windows but ultra-resistant bio-engineered film, which tended to change over time from clear to opaque with the effect of both external wear (particules carried by the wind) and the humidity and internal carbon dioxyde emanations that darkened it. Changing these costly and complex pieces only occured after dozens of years, so most of the time, great panoramic views were provided by giant modular digital screens coupled with external cameras. As a bonus, the image was colored and made brighter, as on earth to give a salutary illusion to cope with natural depression, compounded by short days. When out, every colonist in a full suit -fortunately light enough to allow quick and easy moves- could see the wan reddish light setting on every landscape. Proxima was a barren and cold place. There were however earth-like features shaped by old water erosion, and some amazing canyons and depressions. If not cold, the feebly core meant geologic quietness. No volcanoes, almost no sismic activity, although the pull from the mother star was enough to keep some degree of activity, which turned out to be much greater in the past, when the planet used to be nearer, or surrounded by other planets that pulled on it (and long collided and assimilated). The last active volcano (culminating to 4000m and with a crater large enough to gobble Louisiana) was also long extinct, but relatively active on a sismic point of view. Old rifts were also still semi-active, with a continental shift slowed to 0,0002 times compared to earth. Daily life for colonists was rythmed by the six-part days, working in obscurity shifts four to five times, resting one night and one light shift. There were many activities to content with, from outdoor geologists, indoor chemical experts, biologists in charge of the giant biospheres that produced oxygen and a reservoir of diversity while hydroponic exploitations were buried underground. Most of the superstructures were either made of aggregated silica domes, or inflatable structures. Pressure was low enough to ensure these stayed inflated at all time. There was no breathable air. Oxygen was only present as traces, most was Co2, and it was calculated one can survive up to three minutes in direct exposure at 18 megapascals, much more (up to two hours in some cases) with a compromised, just leaking suit. All suits, like on mars, the moon and everywhere humans worked previously on a regular basis, suits had a layer of composite nanometric self-generating tissue that colmated any breech within seconds, plus carried patches that can be applied quickly on any leak. Problems only occured with very large breeches or if the suit was ripped off and compromised almost entirely. Of course after their torough anaysis of the present and past geology, electromagnetic signature, and star's specifics, it was evaluated at first a terraformation would not be viable before at least eight centuries, provided all the required ressources (chiefly financial) were available. Each terraformed planet has its own "equilibrium point" after which the atmosphere stays stable without external imputs for a millenia or more. It was calculated the planet would be slightly colder than Mars however, only livable on the equator, if it was not for the lack of geological activity and therefore electromagnetic cushion to fend off UVs from the three stars, not life friendly. After a years-long study it was decided there was no point of starting such process. Proxima would never be terraformed, but it was later "domized" systematically by the second wave of colonists in the next millenia, that took great advantage of its proximity and compatible gravity. There was however two plans which existed for all planets lacking the same kind of natural electromagnetism: One included the detonation of the serie of nuclear charges to move and "relaunch" the planet's core, and another that included the generation of an artificial field from both poles. But these were humoungus and very costly structures to start with which were energy-hungry and had no other purpose than creating this umbrella, not generating any direct gain on the meantime. Both propositions were tested in rare cases, but with with Proxima B/Luitgi. Before falling into oblivion, Proxima became for almost a thousand years a vibrant vanguard post to stage expeditions out to the nearest stars. Planets were quickly colonized, ressources harvested, orbital stations built, and despite harsh conditions, humanity reached about 300,000 on Luitgi at its peak, living on a network of artificial habitats. Proximity with earth meant most were able to do regular trips to earth, but for most it was just a professional stage, lasting for dozens of years at the most. "proximians" never felt understandably the attachment palpable with a terraformed planet. By the fourth millenia, a second wave of colonists, the Doms, totally transformed the planet, which by then has been almost completely abandoned. With a hundred new domes scattered around this large plant, population gradually rose to 8 billion, this time of "true" Proximians. Of course Proximian eyes rarely saw the three suns ballet, but from surface observation posts. The planet had a life of its own, with many species proper to this higher gravity which strived for severa millenias, before going into dardkness again due to a catastrophic meteoritic accident, as often with Dom worlds. The rest of its history is all but forgotten. A hundred billion worlds, a view into infinite humanities.